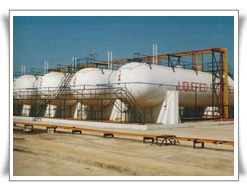 We manufacture of LPG tank above ground as well as mounded and underground LPG | storage tanks of various capacities ranging from 500 Liters to 1000000 Liters . The unit comes with all safety features as per norms. 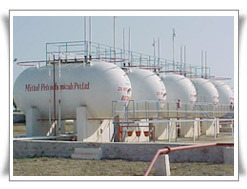 We supply complete facility for lpg storage and use including storage tank, safety fittings, valves, vaporiser, pipelines etc. We manufacture lpg tanks used for industries purpose like cement industry, copper industry, ceramic industry, furnaces industry, fibreglass industry, food industry, automotive industry, glass industry, hospitals, petrochemicals , steel industries, hotels and other applications .